Calgary, Alta. 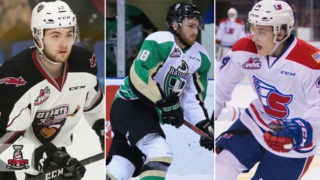 – The Western Hockey League announced today that 2019 NHL Draft prospect Brett Leason of the Prince Albert Raiders has been named the WHL On the Run Player of the Week for the week ending November 25, 2018. Leason retained his title as the WHL scoring leader with 10 points (6G-4A) and a plus-eight rating in three games as the Raiders extended their winning streak to a franchise-record 16 straight games this week, keeping them in the top spot in the WHL and Canadian Hockey League. Leason recorded seven points (4G-3A) at even strength while scoring a pair of short-handed goals. 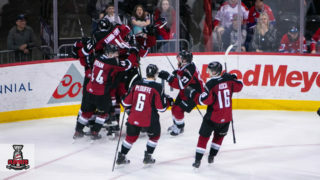 Leason’s week began with him recording the first hat trick of his WHL career in a 5-1 win against the Lethbridge Hurricanes. 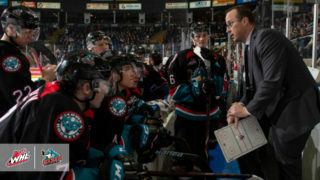 Leason scored Prince Albert’s first, third and fourth goals of the contest, earning first star honours for the game and first star of the night honours in the WHL. The win improved the Raiders to 13-0-0-0 at home, the best of such records in the entire league. Friday, Leason potted a pair of goals as part of a four-point night in a 7-3 win against the Medicine Hat Tigers. Leason scored Prince Albert’s second and fourth goals of the game, also picking up primary assists on their third and sixth goals. Leason once again claimed first star honours for the game and earned third star honours of the night in the WHL. Leason closed out his impressive week with a goal and three points in a 5-1 win against the Kootenay ICE. Leason opened the scoring in the contest, while also picking up primary assists on his team’s third and fourth goals. Leason completed a hat trick of another kind, earning his third-straight first star of the game honour. 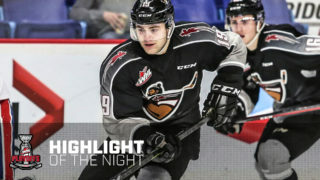 Recently recognized by NHL Central Scouting with a ‘C’ rating on their updated ‘Players to Watch’ list, Leason has been one of the driving forces behind the Raiders’ strong start, leading the WHL in scoring with 54 points (25G-29A) in 24 games, including two power-play goals, five short-handed goals, and six game-winning goals. The 6-foot-4, 199-pound forward was originally selected in the third round, 50th overall, by the Tri-City Americans in the 2014 WHL Bantam Draft. In 159 WHL regular season games, Leason has 105 points (49G-56A). 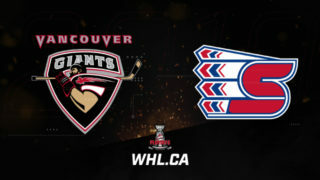 A product of Calgary, Alta., Leason has five-shorthanded goals, pacing him to challenge the WHL record set by former Raider Al Stewart during the 1983-84 WHL Regular Season, when he recorded 14. The Raiders also lead the WHL with 15 short-handed goals, doing their part to challenge the WHL record set by the Spokane Chiefs in the 1990-91 WHL Regular Season when they posted 31. 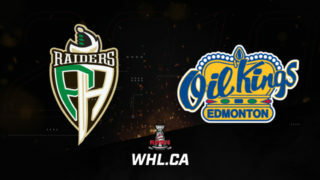 The 23-1-0-0 Raiders will look to extend their 16-game winning streak when they roll into Central Alberta to face the Red Deer Rebels Tuesday, November 27 (7:00 p.m. MT) at the Enmax Centrium.